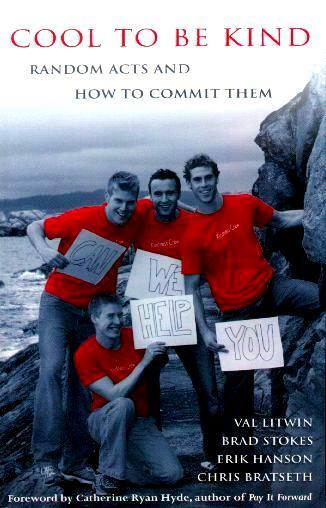 This is the charming account of four young men from Victoria, Canada and their acts of kindness across the country. Random acts of kindness to total strangers in the hope of spreading the gesture. Whether it's a smile, or a massage, or even physical labor, Val, Brad, Erik, and Chris show the post 9/11 world that being nice to one another can be achieved. I take my hat off to these young men who promote being nice as opposed to the less productive route some youngsters take. These guys had the courage of their convictions and went out and did what they felt the world needed. We're not used to strangers coming up to us out of the blue and wanting to do something nice for us, without thinking there must be an ulterior motive. The only "motive" they have is for you to then pay it forward and do something nice for someone else. The author of the wonderfully inspirational book Pay It Forward, Catherine Ryan Hyde, wrote the foreword to this book. How happy her heart must have felt. Sadly, so often it seems, that we get this attitude later in life when we actually feel the urge to go that extra mile for others. These guys have a huge headstart on the rest of us and I say, Bravo! They call themselves the Kindness Crew and their tour across Canada, the Extreme Kindness Tour. Contact them at either their website extremekindess.com or e-mail them at thecrew@extremekindness.com - they encourage you to write to them about putting together your own "crew" and to tell them about the kind things you've done. Conclusion - Totally inspirational and a joy to learn goes on around us.